Boethius was a Roman senator, consul, magister officiorum, and philosopher of the early 6th century. He was born four years after Odoacer deposed the last Roman Emperor and declared himself King of Italy, and entered public service under Ostrogothic King Theodoric the Great, who later imprisoned and executed him in 524 on charges of conspiracy to overthrow him. 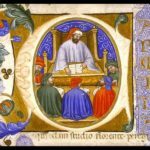 While jailed, Boethius composed his Consolation of Philosophy, a philosophical treatise on fortune, death, and other issues, which became one of the most popular and influential works of the Middle Ages.